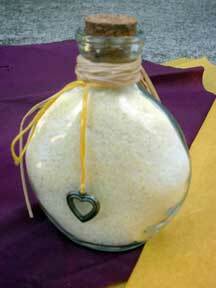 Give the gift of relaxation with this easy to prepare homemade bath salt recipe. Simply adding a couple drops of coloring and a few drops of essential oil, will turn ordinary Epsom salt into sweet luxury. Customize these simple bath salts by choosing one of the different essential oils listed below the recipe. Yes, homemade scented bath salts can be this easy! Epsom salts are relaxing, detoxifying and anti-inflammatory all by themselves. 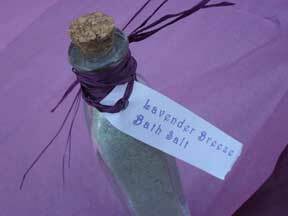 When you mix in the therapeutic benefits of pure essential oils, you have a bath salt recipe perfect for homemade gifts. Add a little color and package your bath salts in gorgeous containers for beautiful homemade gifts. Tip... Get an AWESOME deal and make this project even easier by having bulk Epsom salts and/or Dead Sea Salts delivered to your house. ...Sea salts can be mixed in with the Epsom salts for even more healing benefits! Note: If choosing to use dye, liquid food coloring is recommended over gel because gel won't blend evenly with the salts. If you have to use gel coloring, mix well with 1/8 cup of unscented (or compatibly scented) oil first and then add it to the bath salts. See below for recommended oils. 1. Pour salt into a plastic zip bag (or sealing food storage bag). Add a few drops of essential oil. Close bag immediately and shake well to mix scent thoroughly. 2. Next add food coloring a couple drops at a time. Shake well and add more color only if needed. 3. Finally, if you have time, let the mixture sit over night and then shake the bag one last time for the most even color distribution. 4. Package and embellish your homemade gift in a glass jar or cellophane bag. 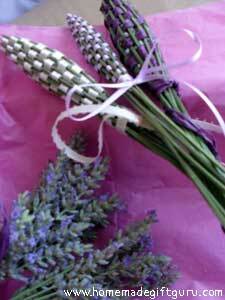 Easy Breezy Lavender. Several drops of lavender essential oil and a couple drops of red and blue liquid food coloring. Relaxing. Stress Reducing. Sensual Jasmine. A drop or two of red food coloring and few drops of jasmine essential oil will make a soft pink floral bath salt. Romantic. Sensual. Refreshing Mint. Make a soft green bath salt that is both refreshing and soothing. Simply use a drop or two of green food coloring and a couple drops of peppermint essential oil. Invigorating. Stimulating. ...or try this awesome mix for Peaceful Sleep! Add two tablespoons coconut oil*, grape seed oil or sweet almond oil to bath salts. Mix well. *To liquefy coconut oil, put desired amount in a glass or jar and set in warm water for a few minutes or until liquefied. Then mix into salts. Get tips for choosing the best jars for jar gifts. For an extra special gift, this easy bath salt can be paired up with scented bath powder and packaged in a lovely gift basket. Gift tag templates are useful for making bath and body gift tags. You may also like this collection of free printable gift tags. And be sure to check out these printable gift tags made JUST for homemade gifts (sample to the right)! 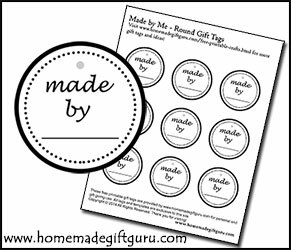 Free printable gift tag templates make beautiful homemade gift tags for your bath and body gifts!